Sandals Resorts – always on the cutting-edge of innovation in the Caribbean from creating the first swim-up pool bar to the Over-the-Water Villas & Bungalows – has unveiled the newest addition to its Over-the-Water Collection. 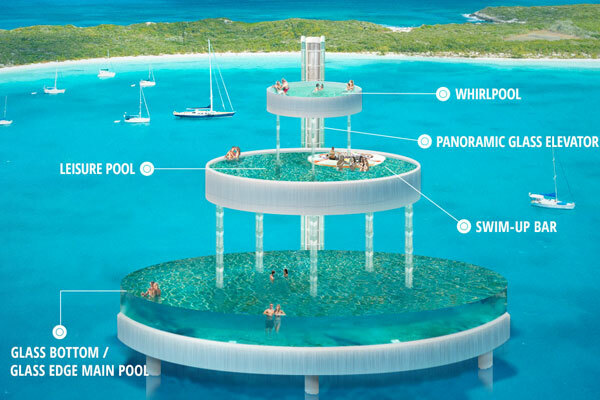 Taking luxury to new heights, the world’s first, three-tier glass bottom pool will showcase panoramic views of the Caribbean Sea from any angle. Couples can ascend to the top-floor whirlpool in a glass elevator, grab a drink at a Sandals signature swim-up pool bar on the second tier or simply enjoy unobstructed views from the infinity-edge, glass bottom pool hovering over turquoise waters. This towering tribute to all things over-the-water is Sandals’ latest crowning achievement.